Naomi Wadler is the preteen activist who gained viral national notoriety with her stirring call to action at the March For Our Lives Rally held in Washington, D.C. earlier this year. 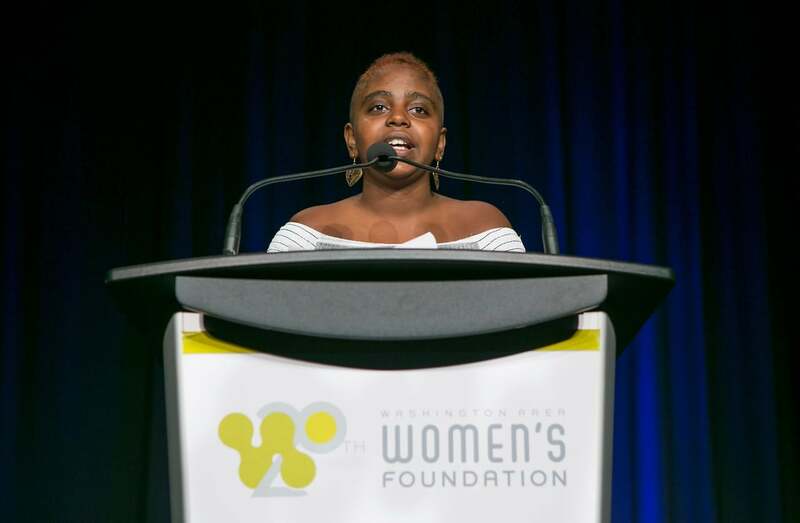 On October 30th, the Washington Area Women’s Foundation celebrated Naomi at their 2018 Leadership Luncheon, as well as the 20th anniversary of the foundation. Naomi also used her time to debut the inspiration behind her new hairdo. “Truly, tell everyone you know that if some 12-year-old girl can shave her head and dye it orange, the least they can do is go and vote!! You know how much bleach hurts your scalp? If you can’t do it because it is SO important, do it for that pile of curls sitting on the Haircuttery floor,” Naomi said. During the keynote, Naomi also paid homage to those activists who came before her. “Young women have always been at the forefront of every important movement in our history. Harriet Tubman was 27 when she escaped slavery, Claudette Colvin was 17 when she was arrested for refusing to give up her seat on the bus (9 months before Rosa Parks), and Ruby Bridges was 6 years old when she bravely faced down racism day after day for the right to get an education,” she said. She also announced her partnership with Safe Shores, a DC-based Child Advocacy Center. “I have partnered with them to sell a t-shirt. “Kind is the new Cool” is our slogan and 100 percent of the proceeds go to support the work they do. You can buy one at ww.naomimagic.com”. At the end of Naomi’s address, ESSENCE had an opportunity to sit down and speak with the young activist, and she had a few words for those people who are still undecided about voting. “I would like to say to them that their vote matters, and that they can make a difference. No matter how small they think their vote is it truly can have an impact,” she said. One important issue that’s close to Naomi’s heart is gun control, and seven months after the March For Our Lives, Naomi does think people are more aware of gun control issues. “I feel that we’re more aware because there are definitely some areas of the country where certain people wouldn’t have even thought of gun violence as a problem. We’ve helped people be more aware, and be able to recognize that we have a problem, which is a crucial part to being able to fix the problem,” Naomi said. Over the last several months, Naomi expressed that she’s been able to connect with a lot of older activists, but she still has some advice for her fellow young people, especially when it comes to how to get started in activism. “I would like for kids to think about what success looks like to them, and that could be printing and handing out flyers for a cause that’s important to them, that’s a great place to start,” Naomi advised.